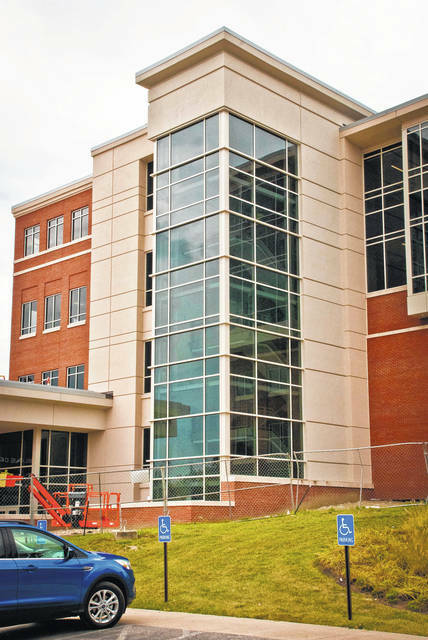 Delaware County commissioners accepted a certificate of substantial completion Thursday from the construction management company, Lendlease, for the new Delaware County Courthouse. According to Jon Melvin, facilities director, the building now has a temporary occupancy permit. After delays in construction of the new $39 million, 94,450 square-foot courthouse, Delaware County Commissioners officially accepted a certificate of substantial completion for the structure on Thursday. The originally agreed upon completion date for the building was June 30, but that was changed to July 31 when it was realized that construction would not be completed by the original date. Fuller presides over the new Domestic Relations Court located on the fourth level of the building, which houses four hearing rooms and a courtroom. The magistrate and courtrooms are located on the fifth level, which includes separate mediation spaces for attorneys to speak privately with clients. Melvin said landscaping will be finished on the outside of the building this week and the safety fencing will be removed on Monday. According to the plans, once the landscaping is finished, a plaza will be located between the new facility and the Hayes Building. The main entrance has two levels of underground parking, with the lowest level for staff and the public. Melvin told the commissioners that the audiovisual contractor was in the building installing the court recording and evidence presentation systems. He anticipates them being completed in the next couple of weeks, after which the court staff will need to be trained on the new system. The commissioners recently toured the building with Melvin. Commissioner Gary Merrell asked if there has been discussion about holding an open house for the public. Melvin said since the permit was for temporary occupancy, the general public wasn’t allowed in the building. However, he said there had been brief discussions with communications manager Jane Hawes on a date for an open house. This entry was tagged Commissioners, Courthouse, delaware. Bookmark the permalink.